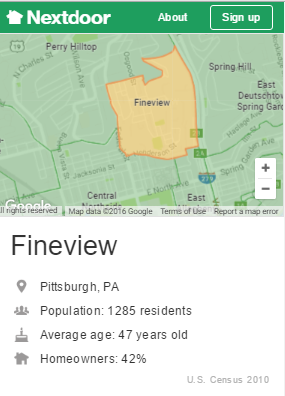 Fineview Citizens Council, a 501(c)3 organization on the Northside of Pittsburgh, seeks to improve the quality of life of its residents through the redevelopment of vacant and blighted lots. Through the Council’s efforts, home values have increased, new residents have been attracted to the neighborhood, and urban decay has been greatly diminished. The council also engages residents by holding regularly scheduled community meetings and encouraging residents to become involved in various community initiatives.